If you see the dream of becoming a nurse practitioner, then you can’t only rely on personal skills. Your nursing personal statement for mental health or nurse practitioner that you’ll create for this program must be appealing for sure. Adding the important elements in personal statement actually play an important role to grab eyeballs of selectors towards choosing you for this program in school. Always remember that a nurse practitioner personal statement is written by giving full concentration and learning the actual ways of creating it. What Are Nurse Practitioner Program Requirements? It is suggested to never avoid following the important directions. Not all types of nurse practitioner personal statements are similar in the format. Whatever you write, add honest information. This is how you can actually impress the admission committee. Never divert from the track of writing. Try to write the content professionally and passionately. Follow an outline to avoid making any mistake in the whole writing procedure. Make in-depth searches for writing the best personal statement. Always use the appropriate language of nursing. Use of irrelevant vocabulary is definitely not allowed in the nurse practitioner personal statements. Spend ample time in the writing process. It is also about thinking and then turning your right thoughts into the paper. The grammar and syntax errors need to be rectified in the personal statement. Here is a list of some leading family nurse practitioner programs you can consider for pursuing a successful educational career in this field. These programs are highly recommended for the individuals out of the state and even the U.S. If you can afford, then there can’t be any best option than any of these to become a successful nurse in the future. 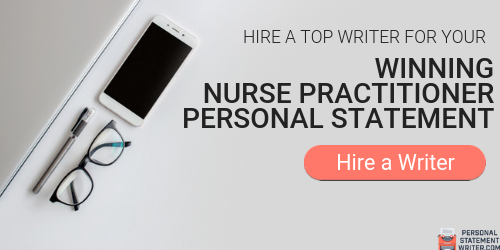 There are a variety of options when it comes to choosing a personal statement for nurse practitioner writing services. We can provide you the desired services by giving assurance of seeking admission in the university of your choice. Have a look at some major benefits of relying on our best services. Our professional nurse personal statement writers are well-aware of all the major components to be added in the document. You will be able to save the money by seeing major differences in our fee. The best quality content with the guarantee of making multiple revisions (if required) would be provided. The well-qualified staff who’ve years of prior experience in the field of writing personal statement are ready to give you surety of getting admission in desired nursing school/college. It is your right to know why you would actually prefer us over numerous writing services providers. The major reason is the excellent support and assistance from our team. This only results in delivering the expected work but also guiding you about the actual method of creating a nurse practitioner personal statement. Our team doesn’t believe in making claims and showing nothing as proof. Therefore, you shouldn’t feel any hesitation in writing personal statement with experts. Feel free to ask any query or the confusions you’ve about our writing team. Your satisfaction is our major priority before anything else. Employ the highly professional yet reliable nurse practitioner personal statement writing services here!